1) In groups of 5. Zig-zag drill. Light touches with outside of boot between cones, turns, step-overs, feints and at cone. Emphasise use eyes, arms, fake pass, drop shoulder to send opponenet wrong way. 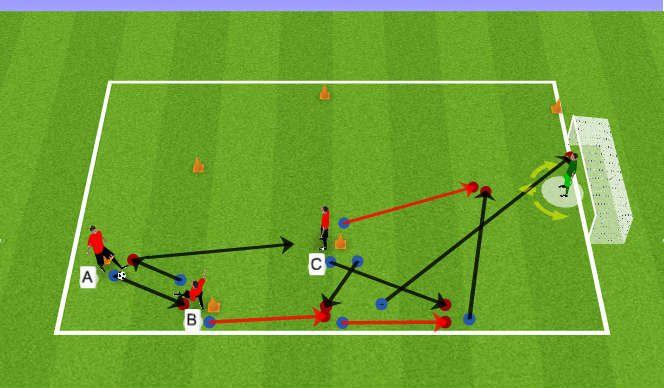 3)A plays to B, sets to A ,A plays to C, B times his run, C plays a quick pass round the corner and spins very quickly, B plays a cross in and C tries to get across front post and finish. 3)3 touches max focusing on body posistion, receiving skills and quality of pass. 1) GK must play the ball to x1 and x2. 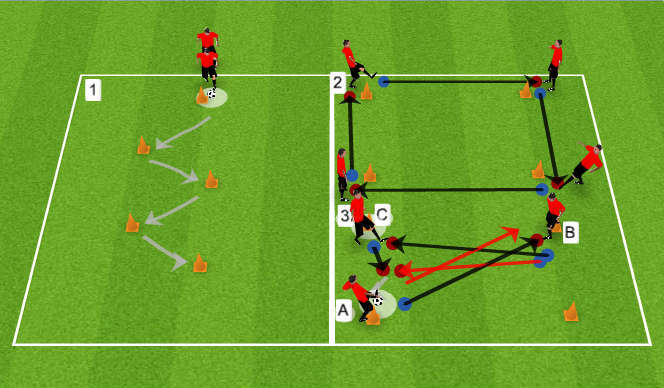 The full backs must use the receiving skills used in section C/practice 2 and be positive and go forward.